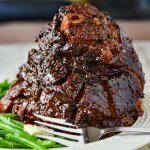 This gorgeous sticky glazed ham will sit beautifully on your Easter Dinner Table this year. It’s coated with a sauce made of brown sugar, molasses, and grainy mustard. A touch of cinnamon, cloves, and fresh ginger enhance it as well. Remove the ham from the package and pat dry with paper towels. Using a sharp paring knife, score the outside of the ham with diagonal cuts (1/3-1/2 inch deep). See notes below. Place the cut side of the ham down into a shallow roasting pan, cake pan or casserole dish. Cover tightly with foil and place in the oven for 1 hour and 40 minutes. 10 minutes per pound. Halfway through the cooking time, combine the remaining ingredients in a small pan. Stir together and heat to a low boil over medium-high heat. Reduce the heat to medium-low and continue cooking for 3 minutes, stirring constantly. Set aside and cool to a warm temperature. When the ham has finished cooking, remove the pan from the oven. Adjust the heat to 450°F. Drizzle 1/3 of the glaze over the ham and spread it over the entire exposed surface, leaving the cut side down. Cook the ham, uncovered, for 15 minutes. Drizzle and spread another 1/3 of the glaze onto the ham. Return it to the oven for another 15 minutes. Remove and glaze again with the remaining glaze and cook for another 15 minutes. Remove and let it cool slightly before carving the ham. When shopping for a ham consider how many guests you will be serving. One-half pound per person is what you are looking for. So if you are planning for 20 people, you will need a 10-pound ham. If you want a lot of flavor, go with a bone-in cut of meat. When the bone is heated, the marrow (rich in fat and other amazing flavors) penetrates into the meat which creates a juicy and tasty end product. Scoring means to make shallow crisscross cuts in the outer fatty portion of the ham to allow the glaze to penetrate the meat. Start at the top of one side of the ham, using your knife, cut diagonally down to the end of the other side. The cuts should be 1/3 to 1/2 inch deep. Continue cutting diagonal lines about one-inch apart across the whole ham. Next, using the same diagonal lines one inch wide, cut from the other direction. Use a sharp paring knife when scoring the ham. If your knife is dull, it will tear the ham and not give you the pretty diamond shape pattern that you’re looking for. Cover the ham tightly with foil at this beginning warming stage. This helps prevent the meat from drying out as it creates is own steam within the foil. Be careful not to cook the ham too long or at too high a temperature – 300°F and 10 minutes per pound. This helps ensure the ham will not dry out. At some point in the middle of cooking the ham, prepare this glaze. You want it to sit for some time, cooling a bit before it goes on the ham. It needs to be warm and runny enough to spread on the ham, but not too cool this it’s hard to spread. There’s no need to cover the ham with foil when glazing because what is needed at this stage is a caramelization. Increase to the temperature to 450°F. Be careful when spreading the glaze on the ham that you don’t tear up the meat. It’s best if the glaze is still warm when applying it.